2Leibniz-Institute of Freshwater Ecology and Inland Fisheries, Mueggelseedamm 310, 12587 Berlin. 3Leibniz-Institute of Freshwater Ecology and Inland Fisheries, Alte Fischerhuette 2, OT Neuglobsow 16775 Stechlin. A concept is rendered to replace the right-hand side of a set of ordinary differential equations with fuzzy models. This modeling approach allows stake- holder/expert knowledge to be included in the model development, leading to a white box approach and high credibility of models. An additional effect is that models are simple and stable. The system behavior can be controlled flexibly by fuzzy models; a number of examples are presented in the paper. Stability is investigated using the Lyapunov exponent. The approach is demonstrated using a simple aquatic ecosystem model and supported by open source software, namely the “Spatial Analysis and Modeling Tool” (SAMT), with additional modules written in Python. Ordinary differential equation (ODE), Fuzzy modeling, Nonlinear systems, Dynamic fuzzy simulation, Simulation, Stakeholder-based approach, SAMT, Python. Mathematical modeling is an important instrument for investigating complex relations in our human world . Mathematical modeling is extremely useful not only in economics, but also in technical and science disciplines. Three main pillars that explain why mathematical modeling is important can be identified: simulation/prognosis, decision support and understanding. Just to mention a number of examples from the vast array of ecosystem models available (a relatively recent overview can be found . A very rich source of models is the register of ecological models 1, the description of ECOBAS . (Ernst et al., 1997). For example EMMO  can be found there. Decision Support: The use of models to provide a basis for decision making is growing in importance. SALMO, for example, was developed to help manage water reservoirs (see, for instance, the GETAS project)2. This class of modeling also includes statistical analysis, as shown in  models for transferring semantics to users, such as that discussed in , and so on. According to , the use of models to support decision-making should include stakeholders in the actual modeling process. This open modeling approach increases the credibility and level of acceptance of simulation results. It is also not necessarily less accurate than simulation models. It was shown in  that a simple model based on expert knowledge can generate better results than a highly sophisticated process oriented model. Understanding: The mathematical model need not necessarily be complex in order to its interactions to be understood. It suffices if (simple) models do not seriously contradict experimental knowledge, i.e. if they de- scribe the observed phenomena qualitatively correctly. This type of model is known as minimal model  Scheffer has shown in numerous publications how such a type of model can help us to understand complex ecological interactions. The advantage of minimal models is that mathematical formulations are simple, and there is less need to find parameter values and to run models with default values. Summarizing: Minimal models may be described as being “as complex as necessary but as simple as possible”. The general need in mathematical modeling is abstraction. It is evident that the degree of abstraction, i.e. the extent to which details are not mapped in a mathematical description, is a matter of actual knowledge and of the aim of modeling. The degree of abstraction even depends on the modelers taste and intuition. In  (page 9), a graphical model is shown visualizing the existence of an optimum: a more detailed mathematical model will produce a lower process-related bias at the cost of the uncertainty of measured input quantities, whereas a less detailed model will be biased with respect to the relevant processes. An acceptable compromise must be found. When statistical models are applied, the existence of an optimum can be directly shown, as demonstrated by . In this paper, a proposal is made to replace the right-hand side (rhs) of Ordinary differential equations (ODE) with dynamic fuzzy systems. It will be shown that this fuzzy approach leads to an easily understandable and adaptable model. In addition, the model is highly flexible towards model functional behavior, and should exhibit good numerical stability. In the words of , the resulting modeling framework should be considered as “participatory modeling”, not only for stakeholders as in the mentioned publication, but also during a preceding stage for efficient cooperation with experts involved in conducting experiments. 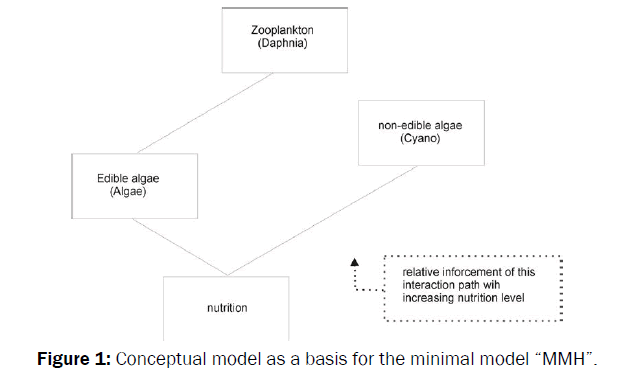 A minimal model, following the ideas of Scheffer , contributes to the controversial ecological debate about the mesotrophic maximum hypothesis (MMH), which state that a low level of nutrition leads to a food web system with a few interactive paths. A high level of nutrition, i.e. eutrophic or hypertrophic systems, may lead to a complex food web with many interaction paths or to the absence of these very paths that transfer energy upwards to the top of the food web. Therefore the hypothesis is that in mesotrophic systems, the food web is rich enough to allow energy to be transferred from nutrition to top systems, but poor enough to be efficient. The basic model is schematically explained in (Figure 1). Figure 1: Conceptual model as a basis for the minimal model “MMH”. Finally, the ODE for Daphnia describes the increase in biomass from grazing (with efficiency, eD) and a loss by mortality (coefficient, mD). The idea is that, together with a description of the efficiency of energy transferred to Daphnia (trophical transfer efficiency, TTE), a maximum in the TTE can indeed be found if the parameter of nutrition is varied from low to high values . model in terms such as gD∗Daphnia∗Algae/(Algae+hD), which is known as Monod kinetics , In addition to sigmoid Monod kinetics, fuzzy models are also capable of implementing more complicated interactions. The most important aspect is that biologists in the ecosystem modeling team, who are not necessarily familiar with the requirements of algebraic expressions of the rhs of ODEs, can infer knowledge in a broad sense, without knowing the ins and outs of the numerical consequences behind the model. In a “broad sense” means that knowledge about a system can be expressed in terms of rules that do not necessarily include only one single process (see below). • Check the model using graphical analysis. The development of fuzzy models is supported by open source software, namely the Spatial Analysis and Modeling Tool (SAMT) , which has an integrated fuzzy toolbox. It is important to mention that checking the model is also a step in the model developing process, supported by the toolbox. Equations 4-6 are derived from the additive structure of equations 1-3, whereby the loss terms are considered as parts of F1 and F6. Note that in the original equations (1-3) and in (4-6), phosphorus P is reduced to pf = P −(pgA*Algae+pgC ∗C yano) by Algae and C yano during the simulation; (pgA and pgC are constants). Compared to the original system, the interactions are now implemented more directly: for example, F1 (Algae, P ) expresses that an algae will uptake phosphorus and term F2(Algae, Daphnia) describes that algae will be grazed by Daphnia. Nevertheless, fuzzy models are part of an ODE, as required for describing temporal evolution. This means that the result also depends on the simulation time and step size. The dynamic fuzzy simulator , which is now part of the open source software SAMT, was developed so that biologists would not require an additional tool. The dynamic fuzzy simulator  was developed and is now part of the open source soft- ware SAMT. In addition to carrying out general checks using SAMTs fuzzy toolbox, the fuzzy simulator enables the dynamic behavior to be checked, as well as the complete implementation of dynamic fuzzy models, including the graphical visualization of the systems behavior. 3. Analysis of the dynamic behavior. These steps are described below. The complete model including all fuzzy models, the ODE code and a visualization of the results can be found as open source code on the website3 . Without loss of generality, the model “algae daphnefis” (F2) is selected to explain the fuzzy approach. The basics of the fuzzy algorithm used are described in . Model F2 describes the relation between Daphnia and Algae, implementing a predator-prey model . Both state variables Algae Figure 2 and Daphnia (Figure 3) are inputs of membership functions; the ordinate is the degree of subsethood; and the abscissa is the concentration of the population considered (algae) (Figure 2). If, for example, the relative concentration of Algae is 0.25, then it belongs to a degree of μmh(0.25) = 0.2 to the class “medium high” (mh) and with a degree of μm (0.25) = 0.8 to the class “medium” (m) (Figure 3). Figure 2: Membership function input Algae є [0, 1]. Figure 3: Membership function input Daphnia. 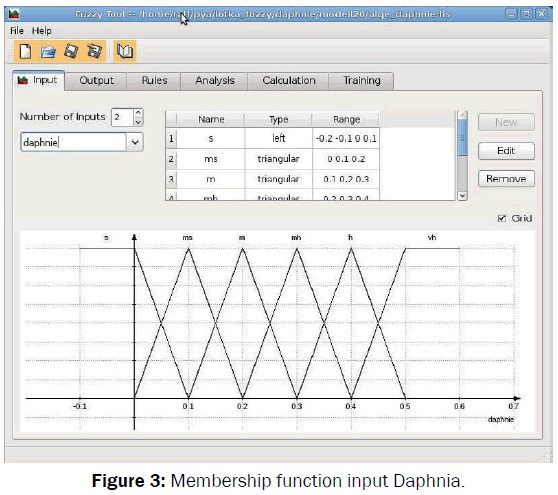 For example, Daphnia belongs to the class medium (m) when (Daphnia = 0.2) is the value on the abscissa (μm(0.2) = 1.0) After defining the member- ship function of the inputs, modelers have to define the output function. So-called “singletons”, which can implement both nonlinear and linear models, are used as the output function . Nonlinear systems have a much richer behavior and more interesting features than linear models .In particular, nonlinear models can express ecological knowledge much more easily than linear models are able to. On the other hand, there is no closed theory available for fuzzy systems, and modelers have to use Monte Carlo simulations as a tool for investigating nonlinear systems. After establishing the set of membership functions for Algae and Daphnia (Figures 2 and 3), we have to clarify what the consequence could be for Algae, for example, with respect to the term F2 considered here. The possible outcomes arbitrarily span a range from [−0.02, 0] in an equidistant manner. We call the resulting system of discrete outcomes (according to the discrete number of combinations of Algae, Daphnia memberships) “singletons”, denoted by ni . The fuzzy model interpolates linearly between singletons to implement a smooth behavior (see, for instance, equation 7) (Figure 4). Figure 4: Singletons as output. The outcomes (n0 = 0.0, n1 = −0.005, n2 = −0.01, n3 = −0.015, n4 = −0.02) express that a high relative concentration of Daphnia will reduce the relative concentration of Algae. The fuzzy model itself contains 5 * 6 rules corresponding to the combinations of membership functions of inputs with singletons. A selection of the rules is presented in (Table 1). Table 1: Excerpt from the rule base of F2. A complete description of the fuzzy algorithm can be found in . : Cython=0.33: SWIG=1 on a normal PC (3GHz, 4GB RAM) under the operating system Linux. An important step in the model development is testing the models and their stepwise extension, which must be supported by a toolbox. Figure 5 shows such test tools implemented using SAMTs fuzzy toolbox. The ordinate is the state variable Daphnia; the abscissa is the state variable Algae; the colors from green to yellow correspond to F2 (equation 5) (Figure 5). Figure 5: Analysis of fuzzy models using the fuzzy toolbox of SAMT. The left-hand side of Figure 5 shows small reductions for Algae and large reductions on the top right. The top right part expresses a large amount of Daphnia and a large amount of Algae, i.e. good conditions for Daphnia and a large reduction, on the other hand, for Algae. In addition to the graphical output, modelers can “click” inside the matrix view to obtain the rule number, rule text, inputs and calculated output of the fuzzy model. As discussed, fuzzy rules allow expert knowledge to be implemented. For example, a high concentration of phosphorus may stimulate the growth of Algae but a too high concentration can be poisonous. This could easily be implemented by adapting the rules pertaining to the fuzzy model. The question is then: can a fuzzy approach model this knowledge correctly? Although we are unable to provide formal proof of this, we will highlight a number of examples to show how powerfully fuzzy models can be applied to generate answers to this question. The first example starts with simple runs to investigate the normal behavior of the dynamic fuzzy system and to determine whether it is sufficiently similar to real systems. In the second example, dynamic behavior is investigated to show that the dynamic fuzzy system is able to produce oscillating results. In the third example, which is related to the second, the stability of the dynamic fuzzy system will be investigated using the Ljapunov exponent. Starting with simple simulations, two typical scenarios were investigated. The first scenario is a “clear water” situation with a low phosphorus con- centration and no flux. Figure 6 shows an increase from the initial relative concentration (Algae=0.01, Daphnia=0.01 and C yano=0.01) to a stationary end concentration over a period of 200 days (Figure 6). Figure 6: Clear water situation: P = 0.05, f lux = 0 (Algae=line, Daphnia=dotted, Cyano=dashed). The second scenario is characterized by a high phosphorus concentration leading to a high concentration of C yano at the end and a suppressed growth of Algae and Daphnia, as shown in (Figure 7). Figure 7: Water situation: P = 0.5, f lux = 0 (Algae=line, Daphnia=dotted, Cyano=dashed). The figures do not contradict experts expectations. Now experts may be interested to discover whether or not the system is capable of simulating oscillating behavior as an amendment (in reference to the classical LotkaVolterra model). An oscillating behavior can be easily found by testing different values for P and f lux. However, we can only ascertain whether this is the best oscillation possible if an optimization routine is applied. The package “NLOPT”10, which contains many useful optimization routines, can be compiled under Linux as a Python module. The maximum of the third harmonic of Algae was chosen as the objective function. The global routine GN MLSL together with local search algorithm LN COBYLA was used to find the optimum. This was found to be a good compromise between being stuck in a local optimum and having too little convergence speed. A table containing speed versus the optimal value of a number of NLOPT algorithms can be found in  (Figure 8). Figure 8: Water situation: P = 0.1985, f lux = 0.0118 (Algae=line, Daphnia=dotted, Cyano=dashed). Note that the oscillation is caused by the dynamic of the actual system (as can also be the case in simple Lotka-Volterra models) and that the oscillating behavior is not initiated by a periodic input. It should be clear that the oscillatory behavior is usually triggered by outer influences. Here, we sought to show that the fuzzy approach possesses the flexibility required to generate oscillatory behavior. A Lyaponov exponent λ < 0 means that the system is stable at this point; if λ ≈ 1, it could be stable or unstable. The Lyapunov exponent can often only be computed numerically. Most of the algorithms used to compute the Lyapunov exponent are based on a linearization of the system using an algebraic method (see  for example). As far as we know, no method exists that can be applied to a fuzzy model. We therefore applied the optimization routine from “NLOPT” to investigate the parameter space in terms of the maximal Lyapunov exponent. For example, two parameters p1 and p2 may be selected to study the Lyapunov exponent as the function of these parameters. Here, we decided to select P (related to the MMH) and f lux, which is known to strongly influence the systems behavior . A map of the Lyapunov exponent was calculated for parameters P and f lux (Figure 9). Figure 9: Map of the Lyapunov exponent; the larger the exponent, the darker (larger) the circles are. The stability of the dynamic fuzzy model was excellent, and was established without any need for fine tuning. Experts know which states of a real system are unstable, applying their supplementary experience to develop fuzzy models. n the traditional modeling process, modelers, often computer scientists, would only consult experts to a limited extent. This limited amount of communication often constitutes a problem, and can lead to suboptimal solutions. Another interesting problem connected to stability is the fact that dynamic fuzzy models can produce chaotic behavior . In the approach discussed, fuzzy models are used to build a dynamic system, and not to control a system. We must still determine whether such a model can be chaotic. There is evidence against chaos in realistic problems due to expert knowledge, which is often more stabilizing . The fuzzy simulator is now part of the spatial analysis and modeling tool SAMT, and can be used together with the SAMT core as a library inside Python programs. The high speed of dynamic fuzzy models enables them to be applied in spatially distributed environments. The dynamic fuzzy implementation is about ten times faster than a plant-water-soil model developed at ZALF , A dynamic fuzzy model can therefore be applied many times in a large region. It was possible to apply the dynamic fuzzy model introduced here to different parts of a lake to simulate a larger part or to the whole lake, for example. The main focus of this paper was to present a general method for handling nonlinear dynamic behavior based on fuzzy models. Even simple nonlinear dynamic systems can exhibit a rich and sometimes surprising behavior, including deterministic chaos. This rich behavior is necessary when seeking to model real systems. On the other hand, such simple models can be under- stood much more easily than complicated models. By reducing it to the main variables that describe a system, we have a great opportunity to understand the systems better, enabling us to move on from their relevant processes. A model is perfect when nothing can be removed. This contribution was supported by the German Federal Ministry of Consumer Protection, Food and Agriculture, and the Ministry of Agriculture, Environmental Protection and Regional Planning of the Federal State of Brandenburg (Germany). Recknagel F. Ecological informatics: A discipline in the making. Ecological Informatics.2011; 6: 1-3. Filgueira R et.al. A physical biogeochemical coupling scheme for modeling marine coastal ecosystems.Ecological Informatics.2012; 7: 71-80. Recknagel F et.al. Hybrid expert system DELAQUA, a toolkit for water quality control of lakes and reservoirs.Ecological Modelling.1994; 71: 17-36. Jopp F et.al. Modeling complex ecological dynamics, Springer, 2011; 389. Benz J and ECOBAS DokumentationmathematischerBeschreibungenoekologischerProzesse. in A. Gnauck, A. Frischmuth, and A. Kraft, eds. Oekosysteme: Modellierung und Simulation Umweltwissenschaften, Bd 6. EberhardBlottnerVerlag, Taunusstein. 1995; 131-140. Scheffer M. Ecology of Shallow Lakes.Chapman&Hall, London.1998; 363. Bruggemann R and Drescher-Kaden U. Einfuehrung in die modellgestuetzteBewertung von Umweltchemikalien. Springer.2003; 519. Hakanson L. Optimal size of predictive models. Ecological Modelling 1995; 78: 195-204. Korn G. Advanced Dynamic-system Simulation: Model-replication Techniques and Monte Carlo Simulation, Wiley-Interscience, 2007; 221. Monod J. The Growth of Bacterial Cultures.Annual Review of Micryobiology.1949; 3 371. Lutz H and Wendt W. Taschenbuch der Regelungstechnik. VerlagHarri Deutsch, 1998; 954. Lotka AJ. Analytical Note on Certain Rhythmic Relations in Organic Systems.Proc. Natl. Acad. Sci. U.S. 1920; 6: 410–415. Wiedemann H. NumerischePhysik. Springer Verlag. 2004; 297.